Divorce is out of style. People love to throw around this tired statistic: 50% of all marriages end in divorce. I’ll say this on behalf of responsible marriage counselors everywhere — It’s just not true. That statement may have been true sometime in the 1980s. But I haven’t worn my jelly-shoes and glo-paint splattered Wham! sweatshirt (that I was SO pleased with) in a very long time either. We need to move on from this idea that half of all marriages are doomed to fail. 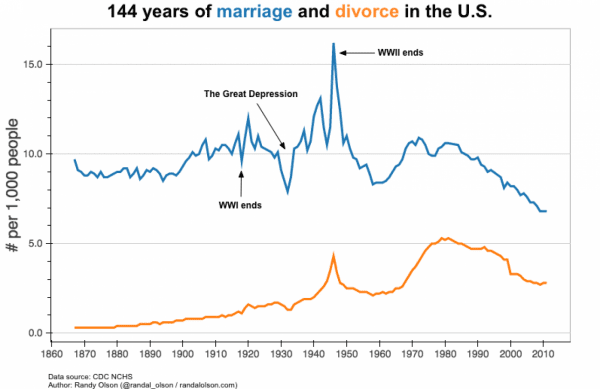 Your marriage is not doomed: Divorce is actually much more rare than you may think. As you can see, divorce rates have been steadily declining since cynical Gen-Xers like me made their last PJ Harvey / Nirvana / Bjork mix-tape in the early 90’s. Why? No one knows exactly, but I have a few ideas. 1) Children of divorce are determined not to replicate their parents mistakes. In most situations, divorce is really hard on kids. Divorcing parents may rationalize their choices, believing that their children benefit from “seeing them be happy” and “actualizing their potential.” But the kids who were left behind living out of suitcases and making themselves macaroni and cheese while their parents took turns touring Tuscan countrysides and having romantic interludes with their new partners in Napa know better. The kids are grown now, and it would not come as a surprise to them to know that research has validated their experience: Divorce is emotionally difficult for kids (except in cases where one parent is divorcing to protect their kids from violence, verbal or emotional abuse, toxically high conflict, or other — greater — traumas, obviously). Because of that, many people getting married now are being very careful to do things that will lower the likely hood of future problems. For example, they are doing premarital counseling because they want to — not because they have to. 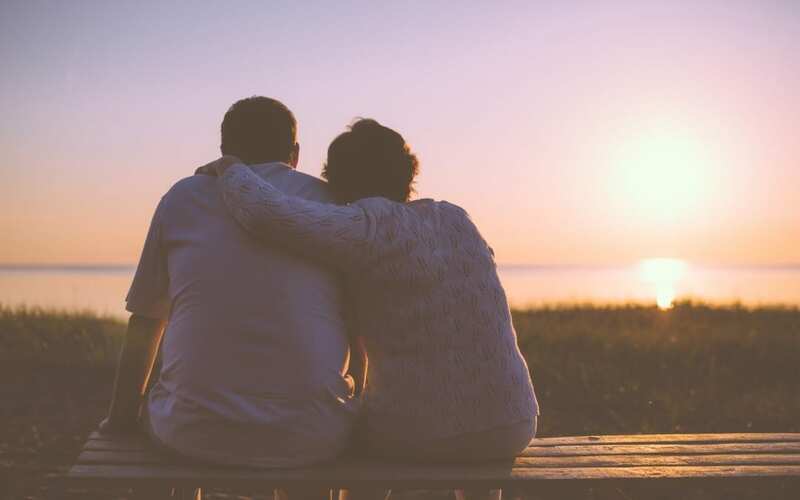 They are also more committed to working through problems in marriage counseling, rather than trading in a fixer-upper marriage for one they hope will be happier. One thing the statistics are very clear on — second, third and fourth marriages are less likely to succeed than the first. This is particularly true for blended family, or step-family situations. Knowledge of this fact may make people put more effort into repairing their marriages instead of bailing when things get hard. 2) People are waiting later to get married. Another strong trend is that people are holding off on getting married until they are in their late twenties or early thirties. This is good for marriage. Research clearly supports the fact that people who rush into marriage and get married young have higher divorce rates. Also people with more education and higher socio-economic status are less likely to divorce. Waiting to marry until you’ve had time to get through grad school and start a career (and also get clear about what you do an don’t want in a relationship) are all factors that lead to long term marriage success. Furthermore, for better or for worse, more couples are living together before marrying. While there are pros and cons to this strategy, one thing is certain: People know each other better after living together. When couples cohabitant prior to marriage they can learn what they’re getting in to, and work to resolve friction areas before tying the knot. 3) There is a “new normal” for marriage. Back in the day, going to marriage counseling was thought of as shameful — “only for couples with problems.” (And if there was a problem, something must be very wrong.) Nobody talked about relationship problems, and because of that people thought that there was something uniquely terrible about their marriage if they were struggling. So they handled it Don Draper style — instead of dealing with it and resolving problems directly with their partner, they’d go to the bar to drown their sorrows in a drink, and possibly an attractive, distracting, sympathetic ear. We know better now. Now we know that ALL relationships go through rough patches. It’s simply the experience of being in a long-term relationship. There is nothing wrong or “broken” about your marriage if that’s happening. It happens to everyone. Furthermore, these “problems” aren’t even necessarily problems, so much as growth opportunities — a chance to learn how to create a deeper, more intimate, and happier marriage. Mainstream talk shows Oprah and Dr. Phil lifted the curtain on the mystery of counseling, and taught millions of Americans about the benefits of getting help for your marriage. Since then, reality TV shows about struggling couples, to podcasts, to self help books, to websites are everywhere. Now everyone expects having a good marriage to require effort. Many happy, satisfied couples — particularly responsible, committed ones — come into marriage counseling or relationship coaching at the first whiff of trouble. They proactively attend to their marriage by enlisting the support of a professional, the same way they’d see a trainer, financial planner, or landscape architect to help achieve goals in other areas of their life. Eliminating the stigma around getting help for their relationship, having more knowledge about how to get help, and having more realistic expectations for married life are all factors helping people stay in the ring with each other instead of bailing wien things get hard. All of which has conspired to drop divorce rates to the all-time low levels they should be.